In today’s test-driven schools, there’s little room for including the world outside the classroom in the curriculum, even though school is supposed to be based on the real world. And prepare us for it. his year I watched good classroom programs which involved and invested students in the learning they were doing come to a halt for several weeks so they could prepare for the standards tests. This, during what is the best teaching time of the school year: January through March, when there are very few breaks in the schedule, and teachers can concentrate on the delivery of curricula. Somehow, we have to wake up, get back to our senses, and use this time for learning. That said, students do need to go out into the world to learn. Let’s look at two possibilities, the first in a stream, the other in a school yard. We’ll do the stream first, since it is the kind of place we ought to be going to. Then the school yard, since it is often the only alternative we have. There are many places where students can find a streambank to explore. Or a wooded area; an open meadow; some place where they can see and count the organisms who live there. Then learn about them. These are wonderful places for students to engage new content via Active Learning. There is one, a small stream, near where I live. Here’s a list of some of those who live there: Salmon fry (very small, recently hatched, eat copepods); Copepods (eat algae and organic debris); Amphipods (eat organic debris, algae); Mayflies (eat algae, organic debris); Caddisflies (eat organic debris, algae, mayflies); Organic debris (this is dead and decomposing organisms on the streambed); and Algae (plants found on the streambed and submerged rocks). This list of organisms and information about them is abbreviated, mostly out of necessity; this is a blog, not a book! Active learning is the best way for humans to learn. It entails having a learner-generated reason to find out something, and access to the resources which will help them find out. Finding plants and animals in a riparian area always stimulates students, and easily leads to conceptual learnings. Providing their teacher is comfortable with this way to learn. This is because noticing something in the world outside your body that catches your interest can, if you’re allowed to follow up on noticing, engage your prefrontal cortex and the machinery it employs in critical thinking. That builds brains. We need to do it. Let’s say you find a stream near your school which has been restored, and supports a small salmon population. Your class can make a round trip to it in 20 minutes, which leaves time to make observations each time they visit. When they make a visit, they’ll group to study macroinvertebrates on the bottom of the stream, algae on the stream bottom and rocks, and animals living in the water column who will fit into a small net. Next, they’ll organize themselves to learn to identify the organisms they’ve found, and find out what the animals eat. This is an opening to several NGSS standards: Let’s look at four, one each from K-3, 4-5, 6-8, and 9-12. (I haven’t started this yet, but it should be doable. It’s all LS.) So, while they’re gathering data to build a food web, they can also be embarking on an integrated curriculum about diversity, thermal tolerance, diet, a John Steinbeck novel; whatever is coming up. For K-3, look at K-LS1-1: From Molecules to Organisms: Structures and Processes, in which students use observations to describe patterns of what plants and animals (including humans) need to survive. In this case, building the food web helps students answer the question of what do living things need to survive. That might also lead to learning how some organisms not having enough to eat might affect their food web. For 4-5, try 5-LS2-1: Ecosystems: Interactions, Energy, and Dynamics, in which students develop a model to describe the movement of matter among plants, animals, decomposers, and the environment. In this case, when one species becomes scarce in its ecosystem, then is lost, this affects the movement of matter in its food web. In doing this, it also affects species diversity. This might lead to learning more about diversity, how we determine it, and what it provides for the species in a food web. For 6-8, try MS-LS2-4: Ecosystems: Interactions, Energy, and Dynamics, in which students construct an argument supported by empirical evidence that changes to physical or biological components of an ecosystem affect populations. This might lead to learning more about how their food web reflects ecosystems, and some of the biotic interactions which affect them. Middle school students might also use their food webs to approach another NGSS standard, MS-LS2-5: Ecosystems: Interactions, Energy, and Dynamics, in which students evaluate competing design solutions for maintaining biodiversity and ecosystem services. Again, they learn how to assess biodiversity, and apply those learnings to their food web. 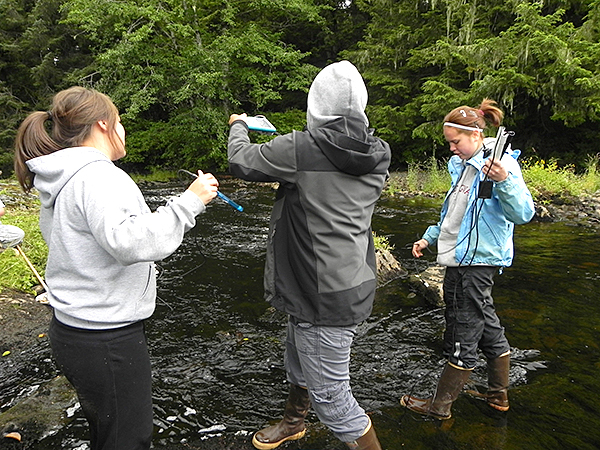 For 9-12, try HS-LS2-6: Ecosystems: Interactions, Energy, and Dynamics, in which students evaluate the claims, evidence, and reasoning that the complex interactions in ecosystems maintain relatively consistent numbers and types of organisms in stable conditions, but changing conditions may result in a new ecosystem. For instance, they can use their food web to learn about thermal tolerance, and how it might cause the loss of one or more species in their food web. Then they might even search the literature for current evidence that, as species move from one ecosystem to another due to the stressors involved in global warming, they are replaced by other species, more tolerant of the changed thermal regime. Can you engage active learning? All of these can be enhanced with lab and field activities. This is in addition to the learning each group of students engages. Because they’re learning about particulars they have engaged in a stream, these learnings will become part of a readily accessible conceptual schematum, rather than a smorgasbord of disconnected facts. Pick one of these which doesn’t seem overpowering, look it up on the NGSS web site, and try it out. Read what the NGSS says about it, then think of what you understand of food webs, and see how you can put the two together. When you’ve done that, then see what area of science you will soon be teaching, and see how you can use the NGSS description plus what you know of your food web, to integrate all into a workable unit to teach. While the NGSS documents don’t often refer to food webs, there are some references to them at the elementary, middle, and high school levels. You can just do a search for ‘food web’ to find them. I’ve used the labels and titles, and the descriptions from the NGSS site in this writing. But I’m uncomfortable with the bureaucratic way they describe a very vivacious, dynamic, interesting system. A food web is one place where much science can be effectively addressed. Then, instead of learning facts about systems, students develop conceptual schemata which tie many areas of science together in meaningful concepts, ideas of how the world works. Figure 1. A Riparian Food Web. Elements of the food web are organized by trophic level. While I’ve named each organism just once, I’ve grouped larvae, both young and mature, in one place, even though they might show up within more than one trophic level if I have considered all of the stages in their lives. And for some, there are more than one species gathered under a name. Considering all species and their life stages would make a more complex, but more informative food web if done with more attention to these details. You can take this as far as your students can comprehend or stand. Complexity increases comprehension up to a point. Beyond that, learners are on overload, and their work isn’t effective. This information/concept overload point is different for each student. You can overcome these differences in capacity by parceling out the work according to each student’s capacity and instructional level. And interest! You’ll find that active learning is evident in the negotiations within groups as they sort out the pieces of their food webs. As they learn more details about the organisms, their conceptual understandings grow exponentially. And their food webs become more complex, and more meaningful. Here is one I made up as an example. It’s based on what you might find in a compost pile in a corner of the school yard. If you’ve ever rummaged a compost pile, you’ll know that this is a much simpler food web than you’d find in most compost. Figure 2. A Schoolyard Food Web. Food webs, by themselves, provide a visible platform for thinking about organisms and their ecosystems in a dynamic, conceptual way. Both species diversity and thermal tolerance can be effectively introduced via a food web. Thermal tolerance can affect diversity as species move from an ecosystem where temperatures have gone from within their thermal tolerance range to one which offers a better thermal regime. Diversity can attenuate the effects of thermal tolerance limits by reducing the effects of losing a food web species. The more diverse the population, the better the chance that other species will utilize the food sources that the departing species exploited. And might be exploited by the same consumer which consumed the species which departed. Like the visible, dynamic structure of a drawn food web, these two biological phenomena effectors of ecosystem stability live in a dynamic relationship with one another. So, what will they do with their food webs? In the next two blogs, let’s look at diversity first, then thermal tolerance. Both will provide valuable insights into the effects of global warming on living things; which is something our students need to become experts in.